Line a deep 25cm cake tin with baking paper and spray the baking paper with oil. Set aside. Season the pumpkin and place on a baking tray, sprinkle lightly with a pinch of cinnamon if desired. Spray lightly with olive oil and roast in a 180C oven for 20 minutes or until soft. Remove from the oven and cool. Layer the potato slices on top of the baking paper on the bottom of the pan and up the sides. The potato slices should be as thin as possible and they should stick to the sides because of the spray of oil. 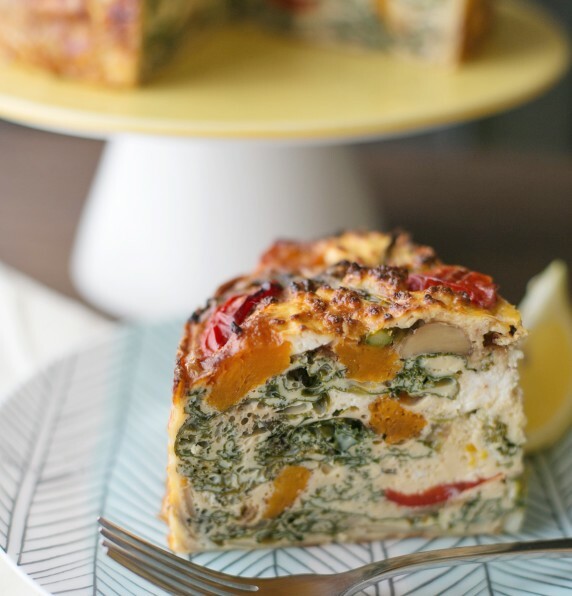 Fill the frittata with kale, asparagus, zucchini, pumpkin, mushrooms, capsicum and feta, making alternating layers of each. Whisk the eggs and cream together and season well. Pour over the frittata and top with the grated cheddar cheese. Put the pan on a baking tray and cook in a 180C oven for 10 minutes. Reduce heat to 160C and cook for a further 15 to 20 minutes. Check if the frittata is cooked by placing a skewer through the middle.